Experience the Jacques Pépin Portal on KQED. This is Jacques' official website formerly known as JacquesPepin.net. View an interactive timeline of Jacques' life and learn about the KQED program, Jacques Pépin: The Apprentice Then and Now. 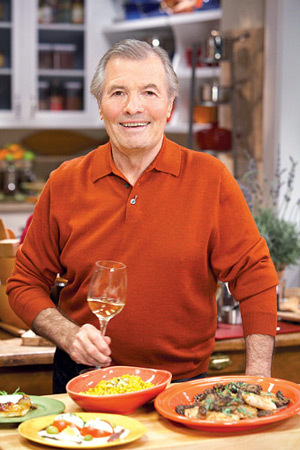 Read a recent interview with Jacques Pépin. As one of America's best-known chefs, cookbook authors, and cooking teachers, Jacques Pépin has published 26 books and numerous articles and has hosted 10 acclaimed public television cooking series. Pépin's newest series and companion cookbook Jacques Pépin: More Fast Food My Way debuted in October 2008, and is a follow-up to his previous PBS-TV series and cookbook, Jacques Pépin: Fast Food My Way. Another of Pépin's books, a visual stunning autobiography entitled Chez Jacques: Traditions and Rituals of a Cook, was published in 2007 and includes 100 of Pépin's all-time favorite recipes along with stories of the food rituals that have shaped his life. Chez Jacques was preceded by Pépin's bestselling memoir, The Apprentice: My Life in the Kitchen, which was published in 2003 and was the springboard for a KQED television special, Jacques Pépin: The Apprentice Then and Now. Pépin was born in Bourg-en-Bresse near Lyon, where his first exposure to cooking was as a child in his parents' restaurant, Le Pélican. At thirteen, he began his formal apprenticeship at the distinguished Grand Hotel de L'Europe in his hometown. He subsequently worked in Paris, training under Lucien Diat at the Plaza Athénée, and acting as personal chef to Charles de Gaulle as well as two other French heads of state from 1956 to 1958. After moving to the United States in 1959, Pépin first worked at New York's historic Le Pavillon before spending ten years as director of research and new development for the Howard Johnson Company, a position that taught him about mass production, marketing, food chemistry, and American food tastes. Pépin also continued his academic studies during this time and earned a M.A. in 18th-century French literature from Columbia University in 1972. A former columnist for The New York Times, Pépin now writes a quarterly column for Food & Wine magazine. He also participates regularly in the prestigious Food & Wine Classic in Aspen and at other culinary festivals and fundraising events worldwide. In addition, he is a popular guest on television shows, such as The Late Show with David Letterman, The Today Show, and Good Morning America. In 2004, Pépin received France's highest civilian honor, the French Legion of Honor, at a presentation in New York. He has also been conferred with two more high honors from the French government: Chevalier de L'Ordre des Arts et des Lettres in 1997 and Chevalier de L'Ordre du Mérite Agricole in 1992. Pépin has held the office of Dean of Special Programs at The French Culinary Institute in New York since 1988, and is also an adjunct faculty member at Boston University. He is a founder of The American Institute of Wine and Food and a member of the International Association of Culinary Professionals. Jacques Pépin and his wife Gloria live in Madison, Connecticut.